Last year, I reviewed a great encyclopedic app called Meet the Insects: Water and Grass Edition. It’s part of Meet the Insects app series, designed with the help of National Science Museum of Korea, which aims to assist juniors in learning about insects. The apps include macro photographs and documentary videos to create an immersive learning experience. Recently, the developers released a brand new app called Meet Science: Magnetism and Electricity. As the name suggests, the app helps juniors learn about magnetism and electricity. The fun part is that it includes recorded scientific experiments and mini games to complement the textbook part of the app. The Learn section has seven lessons with topics ranging from magnet and electricity to electromagnet. 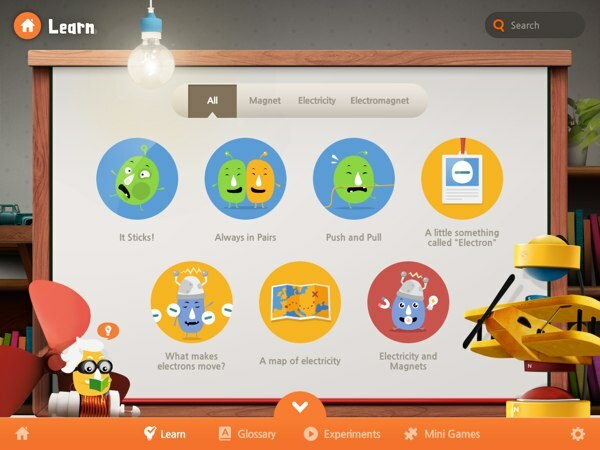 In this part of the app, juniors can learn about seven different lessons within the topic of magnets and electricity. The lessons include magnet’s poles and how they interact with one another, and how electromagnet works. Each lesson comes with unique illustrations and animations, as well as profesionally recorded narration. Using the app feels more like a guided tour in a museum instead of reading a science textbook. At the end of each lesson, juniors can review what they have just learned through Yes/No and Word quizzes. Based on my experience, the questions are not so trivial that you can solve them by taking a glance at the lesson. You need to pay attention to both the lesson and the question to provide the correct answer. When you have completed all the lessons, you can browse through the glossary to learn the important keywords. These keywords are accompanied by illustrations and voice-over narration. You can also learn about important figures in the fields of magnets and electricity, such as Thomas Edison and Pierre Curie. Meet Science: Magnetism and Electricity has 20 detailed step-by-step recorded scientific experiments. What makes this app unique is the inclusion of 20 recorded scientific experiments, showcasing all the required components and steps. After the last step, the video will ask you to guess the result of the experiment. At the bottom of the videos, you can see a transcript of what the narrator is saying. The app also provides you organized summary notes for all the experiments, which come handy if you find the video too fast to comprehend. In this favourite game of mine, players are challenged to complete the electric circuit according to the drawing. The developers also designed three mini games around the magnet and electricity themes. The first one is called Bounce Bounce, UFO. You need to use one finger to move the electromagnet and another finger to change the poles. The idea is to repel as many magnetic UFOs as possible by changing the poles to match the poles of the upcoming UFOs. The second game is called Pop Pop, Lights On. Your goal is to connect as many similar items as possible which are next to each other. To connect them, simply draw a connecting line. The line can be horizontal, vertical, or diagonal. My favourite game is Tap Tap, Connect the Circuit. In this game, you have to rotate the tiles to create the circuit that corresponds to the diagram. Then, you have to put the correct components, such as resistors and light bulbs, according to the symbols on the diagram. The app is suitable for fourth graders who are learning the concepts of magnet and electricity at school. I’m sure they will be more engaged by this app than most school textbooks. I’m also sure that there are many experiments that they’d be interested to try on their own. The developers mentioned that this is the first app in the Meet Science series. I really like the approach used in this app, and can’t wait for the next apps in the series. Even the Glossary in this app is filled with great contents in the topic. Meet the Science: Magnetism and Electricity is the best science app I’ve ever encountered. I love everything about the app. The learn section is comprehensive and the recorded experiments are easy to follow. The mini games also fit the topic well. Meet the Science: Magnetism and Electricity sets the example of what science textbooks could look like in the future.